I will never forget our last family dinner at KIKI'S BISTRO when you came to Chicago with Andrea and 5 month old Sébastien to celebrate Christmas with us. It was almost like a pagan baptism to have our first grand-son share, visually at least for the time being, our traditional day-after-Christmas dinner at this favorite French Bistro of ours. But now, since you have enjoyed going there for so many years on various occasions, including some of your birthdays, I would like to tell you a little more about its owner, Georges ''Kiki'' Cuisance, a man that I have known and liked a lot since the mid-seventies, who was one of the true pioneers of French bistrot cuisine in Chicago, when he launched ''Le Bordeaux'' in 1969. KIKI's BISTRO has become my favorite hang-out and refuge when I feel in need of French comfort, both from a stand point of morale boosting support and familiar good food. I thought that this interview of him, that I conducted a couple of weeks ago, would be of interest to you. Dad. Alain Maes: When and why did you comme to Chicago? Georges ‘’Kiki’’ Cuisance: I came to Chicago from Paris in December 1963. A few years before I had worked at MAXIM’S in Paris for a short time. And in 63 I learned that they were looking for people who would be willing to go to Chicago to work in a new MAXIM'S restaurant that they were planning to open there. I told them I was interested and that’s why I came to the United States. I worked there when it opened under Mrs. Nancy Goldberg first as a sommelier and then as a waiter. I stayed at MAXIM's for 3 ½ yars. A.M Before that, how many years had you spent in the restaurant business, in Paris or elsewhere? G.C: I started in 1951 when I studied for 3 years at a hotel trade school, l’Ecole hôtelière, in Thonon-Les Bains. [Ed. note. A small French city well known for its mineral waters and its spa, near Evian]. In 54 I had to perform my military duties in the French army for 2 ½ years. Then I worked a little bit in Paris as a waiter at MAXIMS. After that I spent a year in England working as a waiter in a hotel. Then I was back in Paris for a few months, still working as a waiter in restaurants and I did a short stint at the "ClOSERIE DES LILAS", before leaving for Germany where I spent a year, working as a waiter in a hotel-restaurant. Then I came back to Paris for a while and worked at the COPENHAGUE restaurant on the Champs-Elysees; but I left again this time to go to Spain, where I stayed for several months, working in a hotel-restaurant again. In the late fifties I was back in Paris where I worked in various restaurants, including the famous private nightclub ‘’CHEZ CASTEL’’ until I left for Chicago. AM: You told me once that in Paris you did a stint at ''Chez Dupont'', the epitomy of an old style French brasserie. What kind of position did you have there? G.C: That’s right, DUPONT WAGRAM in Paris [Ed. note. This big restaurant, not too far from the Arc de Triumph, does not exist anymore but had a famous motto: ‘’ Chez Dupont, Tout est bon’’, “ at Dupont everything is good”]. I was the night manager, which means that I was in charge of closing the restaurant at night , taking care of the cash register, actually closing the place, etc..
A.M: But, you probably had a very specific training? Was it in restaurant and hospitality management, in cooking, in learning to become a sommelier? G.C: I had learned all these trades. At the hotel trade school, during the first year you worked in the restaurant; the second year you worked in the kitchen, and the third you learned all the hotel and restaurant management skills and processes. A.M. : What were the restaurant scene and the food and wine landscape like, when you arrived in Chicago in 1963? CC: The food was not sophisticated at all. You had mostly steakhouses, a few so-called fancy restaurants serving fake French food … there was nothing French about it except the name. You had the ‘’Castro’’ chain which had about 10 or 12 different restaurants at the time: Jacques, l’Epuisette, Le Coq au Vin, Maisons-Lafitte, Biggs and several others. A.M :What kind of food did they serve at these so-called French ‘’traditional’’ restaurants? What did people order? G.C: At the time, the big thing was Beef Wellington. 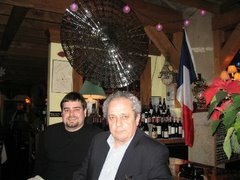 I remember that I went to JACQUES FRENCH RESTAURANT and I had snails served in sherry wine with bread crumbs. It was disgusting… The only salad you could find was iceberg lettuce. It was considered a fancy salad with all kinds of strange dressings: French, a creamy stuff which had nothing French about it, Russian, Roquefort, Thousand Islands. All that has disappeared. A.M: Chicago had a reputation of being a ‘’meat and potatoes town”, was it your experience in those days? Could you find any French bistros in 1963? G.C: If you wanted to be served something decent, you better order meat…You did not want to experiment with fancy dishes at the time, even in fancy restaurants. And, no, I don’t remember any real French bistros in Chicago at the time. Also, nobody knew anything about wines when I arrived in Chicago. You had ‘’Dry Sauternes’’, things like that. Gamay Beaujolais, Chablis. Lancers and Matteus were the big wines of the day. Sparkling Burgundy… All these wines were terrible but people, who did not know any better, loved them. A.M: When did you decide to get into the restaurant business yourself? Was it the result of your thinking: Since there are not too many good places in town, I'm going to create my own? A,M : Did you have an idea of what you wanted to do with it? G.C: Yes. We wanted to do a French restaurant offering diverse things that you did not find in Chicago then: Kidneys, mussels... Nobody knew about mussels in Chicago. We had the first quiche lorraine in town. We had traditional dishes like sweetbreads, brains, and of course we had a steak-frites with real fresh frites. Our French fries were cut in the kitchen. We had also coq au vin and beef bourguignon. We kept the same menu until we closed 20 years later. A.M: And did people accept this kind of typical bistro dishes, like stews, from the start or was it too new from them? G.C: They accepted them well. AM: What type of customers did you have? Any solid base of French clients? G.C: Since it was in the Loop, a business district, we had lots of business people working downtown who came for lunch: Lawyers, bankers, business executives and their staff, etc. Most of them became regulars. The night business was mainly the before the theater, the opera or the symphony kind of people. So we closed very early. And yes, we had a solid French customer base, bankers, lawyers, owners of French businesses, Air France employees and people in the travel business, members of the staff of the French Consulate in the seventies. A.M: What kind of dishes did you serve to the ladies who stopped by for lunch after shopping at nearby Marshall Field’s or Carson’s ? G.C. : We had a lot of salads too, Salade Niçoise, The Neptune and the Surcouf salads that had avocado, shrimps, crab were very popular. Some ladies eating for the first time at Kiki's Bistro nowadays are still asking for them. A.M.: Did your clients ordered wine with their lunch in 1969 ? G.C. : No…no wine. They mostly drank hard liquor, and lots of martinis. A.M: Between 1969 and 1989, did you notice an evolution in the tastes of Le Bordeaux’s clients? G.C: They started to drink wine in the late seventies and in the eighties when people became more sophisticated and started to know more about wines. A.M: So, in 1990 you closed the place, because the building was going to be demolished, and started a new restaurant at the corner of Randolph and Michigan, at the lower level of an office building, that you called the BORDEAUX NORTH. Was it a different kind of client base? Did they request more sohisticated dishes since we were now in the early nineties? G.C. Not really. It was more or less the same kind of clientele and the same kind of menu. A.M.: The next step then was in 1990 when you moved to your present location, and started KIKI’S BISTRO. It was quite a gamble at that time I suppose since your new location was a couple of blocks from Cabrini Green, a housing project of dilapidated high-rises where poverty and crime were rampant. G.C. : Today, everything is fine and under control around here. But it is true that when we came to this location, at 990 N. Franklin, in November of 1990, in the same space where two restaurants had tried for a few months and closed, it was probably still too early to try again to develop a restaurant in this area. This section of town was not appealing to anybody… So it was a bit scary for many people to come here. A.M.: So what did you do to attract customers? Did you offer something special to motivate them to come here anyway? G.C: First, a lot of people knew me and so they followed me here. That helped a lot from the very beginning. And the word of mouth followed. Also I got a few good reviews from restaurant critics in different newspapers, and that helped too. Also, my first chef was John Hogan who until now was the sous-chef under Jean Joho at the Everest Room. He helped me to start the place with interesting new dishes and that was good for me. A.M :Was the kind of food that you served at KIKI’s, when you started, different, or more sophisticated, from what you had at Le Bordeaux? G.C : We started with the basic French dishes like steak-frites, liver, roasted chicken, etc. But every night we had more sophisticated specials. But I had a better chef, Hogan, who had trained in France with some very well known chefs, and he was able to cook, especially the sauces, in a much lighter style, which is what people wanted then. Also at that time people started to eat less meat and wanted good fish dishes. So we gave them lots of well-prepared fish specials. 15 years ago nobody was thinking about opening a steak house in Chicago. Nobody wanted to eat red meat when I opened KIKI’s. A.M: And were the customers who came to KIKI’s at that time more sophisticated? More interested in wines perhaps? G.C. : Oh yes. Many of my customers are well educated and travel often. A large part of them go to France from time to time, some regularly. They know what is good; they have a more developed taste. Chicago also had changed a lot for the better. Nowadays you cannot make it in the restaurant business if you do not have a good chef who cooks interesting and good food. A.M.: Would it be correct to assume that KIKI’S Bistro was the first authentic French sophisticated, post ‘’Nouvelle Cuisine’’, bistro in Chicago? And in what ways was it different from the other so-called ‘’bistros’’ since it was the beginning of a ‘’bistro craze’’ in town? G.C: At the time it was more an Italian craze than a French one… Lots of people wanted to eat Italian, some because it was less expensive, others because it was less intimidating than eating French cuisine. Most of the French restaurants in Chicago were expensive, so many people had the wrong idea. In fact not every restaurant in France is sophisticated or expensive. A.M.: Do you think that in 2006 KIKI’S BISTRO is a mix of traditional bistro and of a more sophisticated restaurant opened to new cooking directions? G.C. : I think so. We still keep the traditional basic French bistro dishes. In the past in France, bistros offered only simple dishes. Now they offer much more sophistication. It’s the same here. We offer more dishes with complex sauces, especially in seafood, than a regular bistro would do. A.M.: And do people drink more wine now those 15 years ago? And what do men and women order, red or white? Do they order more after-dinner drinks than before? What about Champagne? G.C. Absolutely. The difference between what kind of wine men and women drink is much less evident than 15 years ago. 75% of the wine we sell in 2006 is red. Mostly French. We do not sell much brandy anymore. But do very well with Champagne. We sell a lot by the glass and Champagne rosé is very popular. A.M.: Tell me about the now famous logo of your restaurant, a red ''Deux chevaux'' Citroen car from the fifties driven by a waiter holding his tray with a bottle of champagne up through the open convertible top. G.C. : Yes, people love this funny picture which was created by a friend of mine, Ray Strobel, who is a marketing campaigns specialist and designs packaging concepts in Lake Geneva, Wisconsin. A.M.: Let me ask you final personal question: Where did your nickname, KIKI, come from? G.C. When I started to work as a waiter in restaurants in Paris after I left the Ecole Hôtelière, I used to call all the other young waiters ''mon Kiki'' [Ed.note. From the popular French saying '' C'est parti mon kiki'' which means '' We are off and running'']. In return they started to call me KIKI. And for some reasons I cannot explain this nickname sticked to me for the last fifty years. In fact, nowadays relatively few people call me by my real first name.